Two strong storms across the Pacific region have left scores of people dead or missing. At least 10 people have been killed in Japan in flash floods generated by the approaching tropical storm Etau. Meanwhile Typhoon Morakot hit mainland China on Sunday, killing at least one child and prompting almost a million people to flee from coastal areas. It has already passed over Taiwan, killing at least 12 people and causing the worst flooding in five decades. Taiwan's National Disaster Relief Centre said it believed about 100 people were trapped in a landslide that hit the mountain village of Shiao Lin on Sunday morning. Nearly 50,000 people in western Japan have been told to leave coastal areas after warnings of rain, floods and mudslides triggered by the approach of Etau. Eight people have died in Hyogo prefecture, including one man whose car was swept away by a swollen river and a woman who was found dead in a gutter. Another woman was killed in a mudslide in Okayama prefecture. 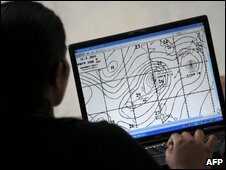 The storm may hit central Japan on Tuesday, an official at the Japan Meteorological Agency said. Meanwhile, Typhoon Morakot dumped a record 2.5 metres (100 inches) of rain on Taiwan over the weekend, leaving at least 12 people dead, among them a group reportedly washed away from a makeshift shelter in Kaohsiung in the south. Typhoons are low pressure systems that form over tropical waters, with organised thunderstorms and winds at low levels that circulate in an anti-clockwise direction in the northern hemisphere. In order for a storm to gain typhoon status, it has to have sustained winds of 74mph (120 Km/h) or more. In the northern hemisphere most typhoons occur between June and November with a peak in September. However, in the north-west Pacific it is possible to get a typhoon at any time of the year. Taiwanese television has reported that about 200 homes in Shiao Lin village have been buried by mud. Roads to the village have been cut and heavy rain and cloud cover have made it difficult for rescue helicopters to reach the area. 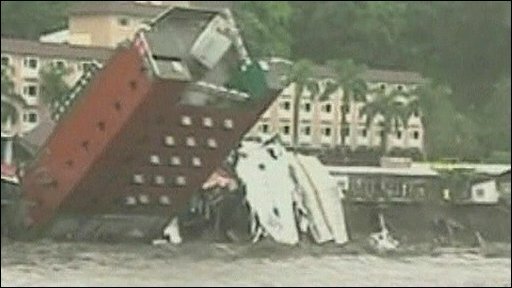 In another incident, an entire hotel - empty at the time - was swept away by the waters. The typhoon then went on to hit mainland China on Sunday afternoon, destroying more than 2,000 houses and causing at least one major river to burst its banks. Chinese state media said the sky turned completely dark in Beibi, Fujian, when it made landfall. Trees were uprooted as high winds and heavy rain lashed the coast. Some 473,000 residents of Zhejiang province were evacuated before the storm struck, as well as 480,000 from Fujian, Xinhua news agency said. In Zhejiang's Wenzhou City a four year-old child was killed when a house collapsed. Dozens of roads were said to be flooded and the city's airport was closed. Rescuers used dinghies to reach the worst-hit areas; in one area only the tops of trees were said to be showing above the floodwater. Although the storm is losing strength, violent rainstorms are expected across six eastern Chinese provinces and Taiwan over the next few hours. Morakot has also contributed to heavy rains in the Philippines. 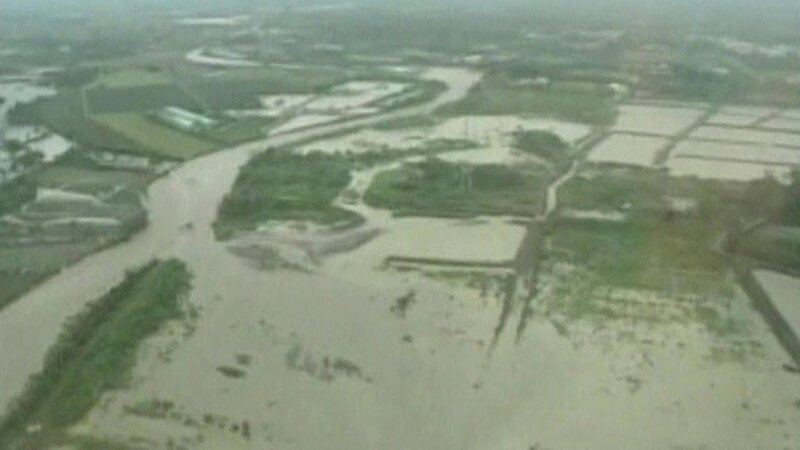 At least 10 people were killed in flooding and landslides in the north of the country last week. Are you in the Western Pacific region? How have Typhoon Morakot and tropical storm Etau affected you? Send us your comments and experiences using the form below.